When a loved one dies, the grieving process coincides with the administration of the decedent’s estate. 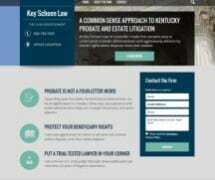 At Key Schoen Law in Louisville, Kentucky, I assist clients with probate – also commonly referred to as estate administration – and represent clients in disputes regarding wills, trusts and other aspects of estate administration. If there was a will in place, it likely names an individual to serve as executor. This person must validate the will, inventory and assess the value of the decedent’s assets, pay all debts and distribute the remaining assets according to the wishes expressed in the will. Every will is as unique as the individual who creates it. Often, an executor is wise to enlist the services of a lawyer who is experienced in estate administration in order to prevent mistakes. I help executors navigate through estate administration, including personal representatives who live outside of Kentucky and who cannot be present to handle the administration process. Lack of testamentary capacity — The testator (the person who drafted the will) did not comprehend the consequences of his or her actions due to dementia, senility or medication. Undue influence — Due to a weakened state, a testator was susceptible to pressure from another individual to change something in the will. Fraud — A beneficiary tricked the testator into signing a will or including provisions that were based on a false statement. Mistakes — A challenge can be based on a mistake made in drafting or executing the will. I am an experienced litigator who is highly skilled at cutting through the clutter and identifying the key evidence that supports a will or trust contest. My experience and stellar reputation as a litigator separates me from other probate attorneys. This frequently allows me to negotiate fair solutions without the need to litigate, given, opponents know key Schoen is willing and able to. If you need assistance probating an estate or with a will or trust contest, call 502-792-7921 to schedule a free consultation.